I had a very different post planned for this morning, but life has a way of throwing curve balls when you're least expecting it. If you're ever curious what's happening with me... where is that Maya... you may find the answer by following me at twitter. That mostly goes for my favorite Aunt A, who always wonders if I haven't posted. But I thought you might like to know, too. Anyhow, I woke up today and canceled our original plans. Packed lunch, swimsuits and kids into the car... and headed a few miles down the road to our lake. We've got a special spot that is very quiet, often it's just us and the water. Peace. Bliss. We welcomed it. My children always love when they have me completely focused on them. We all know how easily distracting home can be... dishes, yard work, studio projects, the computer. I love stepping away. We are in the count down until school begins, and right now all we want is to have undisturbed time together. It's a big year. My baby is going off to her brother's school. She's big and she knows it. We're all feeling the tenderness of this moment. Water is so soothing. I think it brings out the best in everyone. Today, blue of the (icy) water matched the blue of the sky and we let the hours slip by in a dreamy haze. watercolors with lake water... so fun! Swimming, skipping stones, painting, collecting treasures and answering questions about the upcoming year. 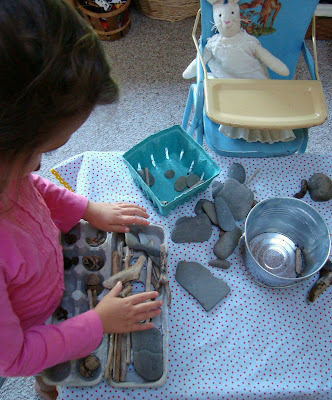 When we got home, we sorted all that we had gathered. Grandma Bunny had some "new school" stories to tell. She always knows when to jump in with her wisdom. A sweet day. Just what we needed. What a lovely day. My kids are already in school and I miss them. 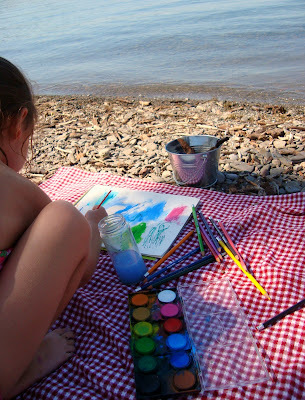 painting at the lake...got to try that! How nice. I love the rocks. Me and my Maya love to collect rocks, shells and you name it. A day at the lake, calm and quiet...bliss! Looks perfect. You do such simple and beautiful things with your children. I hope that when I'm a mom, I'm able to do the same. What a beautiful day! I envy your beach rocks so much! We only have sand on the gulf coast. Fun to walk on but mommy won't let it come home with the kidlets. Homeschool started last week. I'm missing the easy peasy days of the summer schedule. Enjoy your last few days of summer and savor the beginnings of your new life phase. Each one is so very precious. may i ask what paints you were using? i'm looking for a set for my kiddos. 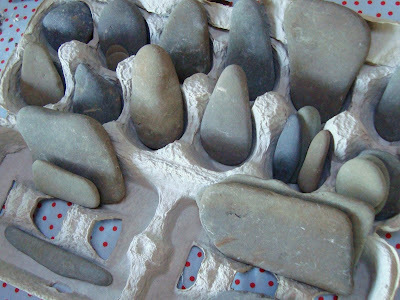 Great idea; the eggbox for the pebble-collection! Looks like you all had a lovely day! Thanks everyone! Wish we could all go down to the lake together. Nice quality art supplies really make a difference. We've slowly added to our collection. thank you so much for the link to the paint sets! i can't wait to try them out.